Most people will tell you that to prepare your flooring for fitting will take 7 days or some may say 14 days to ‘play safe’. However the fact is that there is no set period for acclimatisation. Every site situation is different, which means that every acclimatisation period can be different too. 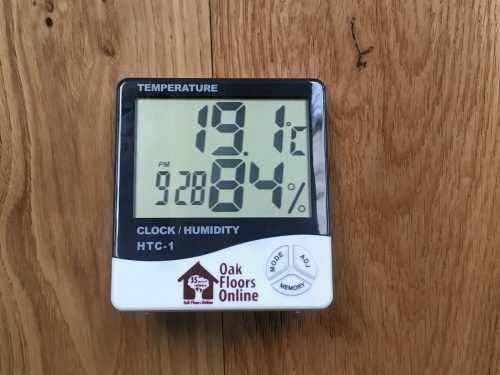 This is why we recommend to always use a moisture meter to confirm that the conditions are suited to and acceptable for the installation of a natural wood floor. The whole reason for acclimatisation is to allow the flooring to reach equilibrium with its surrounding conditions before being fitted, so in other words, you want the flooring to do its moving before installation and not afterwards! The room should be completely dried out before the flooring is introduced into it, to the level that will be consistent when the room is occupied and lived in. Then the moisture level of the room should be checked and monitored (take a reading regularly and when it is consistent for 3 days, the room has reached its constant). Then the flooring should be introduced and stacked as the storage paragraph above. Temperature within the room should be between 15-25 degrees and the Relative Humidity needs to be between 35-60%. Moisture check the flooring now with a suitable moisture meter and monitor the reading. Even if the reading is the same as the room, acclimatisation is still advised before installation. (OakFloorsOnline advise a minimum of 7 days acclimatisation period, even if both readings are the same). Leave the flooring stacked within the room for at least 5 days depending on site conditions. Then check the moisture level with a moisture meter. Continue to check and monitor the moisture level until the reading is constant for 3 days. This should match the moisture reading of the room. Then installation can begin. Relative Humidity during acclimatisation and installation should be maintained between 35-60%. It then must be maintained thereafter for optimum performance. Also to avoid dimensional movement and potential floor failure of any kind. If your subfloor is concrete and recently laid, you’re likely to face more of a challenge when it comes to moisture. Ideally you should aim to have a reading of somewhere between 35 and 40% humidity or 2-4% moisture content before laying your new floor. With concrete slabs taking an estimated month per inch to dry out, this can become quite a challenge. In many cases, the ideal moisture and humidity percentages are nigh on impossible to obtain. So remedial action often needs to be taken. In these instances, the application of a surface damp proof membrane of either polythene or a paint-on damp proof product is desirable. How Dry Should A Concrete SubFloor Be? Rule of thumb for moisture is 1mm per day. E.g. if you had a 10cm/100mm concrete subfloor, it would take around 3 months in order for this to dry. There are certain factors that you should bear in mind when measuring moisture content.Is the room heated? How it is heated and how frequently? Ideally, you should aim to take your readings once the room (or environment) has achieved a degree of stability in its conditions. As emphasised within the first paragraph of this page, when an expensive Oak Floor is being installed. You should want to install it once only. Don’t risking further costs and disruption through attempting to rush or ‘speed up’ the project. It’s not worth trying to ‘cut any corners’ (please excuse the pun). This is certainly false economy and will invariably end up costing you more time and money in the long run.